WITH a string of convictions for fraud going back to his teenage years, serial con man Cameron Corsie has been jailed for 350 days and warned that if he keeps committing such crimes he will spend longer and longer in prison. 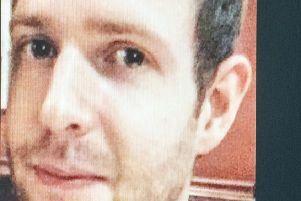 Corsie, 24, the son of the former World Bowling Champion, Richard Corsie, had pled guilty at Edinburgh Sheriff Court previously to five charges of fraud, netting him £2450 between May 15 and July 13 last year. Sentence was deferred until today for reports, including a psychiatric report. The frauds followed a familiar pattern for him. Placing an advert on a website he offered to sell tickets, which he did not have, for the 2015 FA Cup Final, receiving £300 from one man and £350 from another. Making online applications under another person’s name for a personal loan, he pocketed £500 from one loan company and £300 from another. Advertising cars for sale in motoring magazines, he conned one man out of £1000 as a deposit on a car he did not own. Corsie’s defence solicitor, Ray Megson, who had called for a psychiatric report, told Sheriff John Beckett QC that it showed his client was not mentally ill, but did have psychological problems. Help was available for Corsie within the custodial system and a psychologist was prepared to see him. Mr Megson added: “In regard to the frauds, there is never any chance of him getting away with it. He uses his own computer and his grandfather’s e-mail address. It is inevitable he will be tracked down”. Sheriff Beckett commented that it was in Corsie’s own interest to accept help. “For a young man he has spent quite a lot of his youth in custody and if he continues to keep committing these crimes he is going to spend longer and longer in prison”. Corsie, he pointed out, had committed more than 80 crimes of dishonesty. His offending began when he was 17.